No, this piece is not about doing drugs on the playa, it’s about literally lighting yourself up for both safety and entertainment while at Burning Man. Lights are an absolute necessity to ensure safe walking or biking on the playa at night. While some streets are well lit because of activities such as bars and discos or because of the Lamplighters’ kerosene lanterns, most of Burning Man is quite dark. You need to be seen to be safe. Wearing a headlamp is the first line of defense. It allows you to see where you’re going and allows others (especially bicyclists) to see you coming and avoid you. There are small, LED headlamps that come mounted on headbands, weigh very little and throw a lot of light. Hint: Always turn your headlight off when you’re talking face-to-face with someone. It can be blinding up close. But a headlamp is not enough. For one thing, it does not light up your back, which means bicyclists and art cars coming up behind can’t see you. You can choose to festoon yourself with bendable light sticks, but they do not throw a lot of light and they wear out quickly. Lighted hats and clothing are the best answers to enhancing your visibility – and you can do it in style and become part of the art scene in Black Rock City. The key is finding lighting that is small, flexible, bright and battery powered; and you’d be surprised how many options are available to you. One of our favorites is EL Wire, which can be sewn onto or into clothing. You carry the small battery packs in your pocket and can choose steady or flashing light. The EL Wire comes in a variety of colors and is flexible enough to be shaped into almost any design you could think of. Other small battery powered lights (like tiny Christmas lights) are available at Michael’s, Jo-Ann’s and similar specialty stores. They can be sewn or glued onto clothing for both visibility and entertainment. Burning Man is also famous for “pimp’d out bikes.” Heavily lighted bikes are more visible to on-comers and fun to watch. Online retailers such as Hokey Spokes have selections of battery-operated lights that fit on wheels and other parts of the bike. Other stores such as Modern Bike specialize in bicycle headlights, which can help you navigate the playa more safely and enhance your visibility for pedestrians, art cars and other bicyclists. 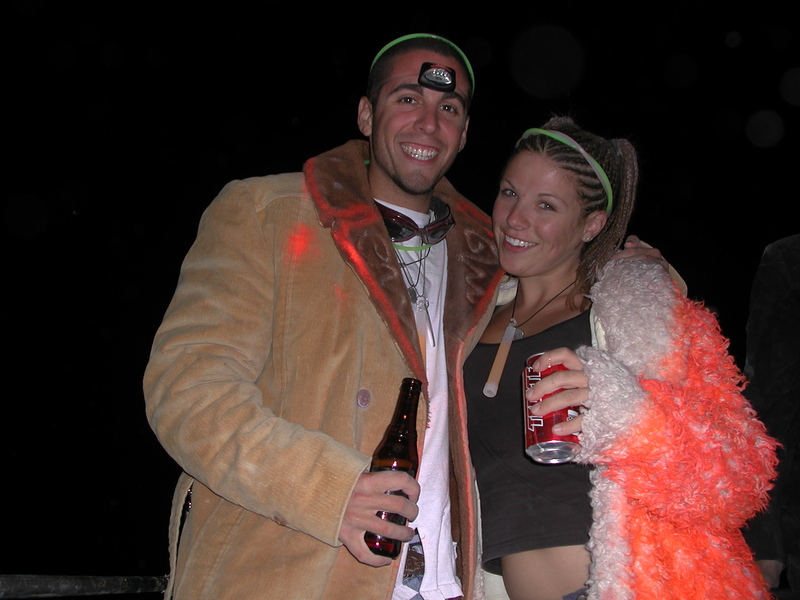 Taking time to brighten up clothing and costumes with fun and attractive lights will add to your Burning Man experience. And if you’re invited to a costume party back home, you’ll have something really cool to wear. Lighting is about safety first, so be sure you can see and be seen. Applying creativity to your lighting is the fun part; but if all you can do in your first year is make certain that you can see clearly at night and that others can see you clearly, then you’ve done the basics and helped ensure safe travelling on the playa.